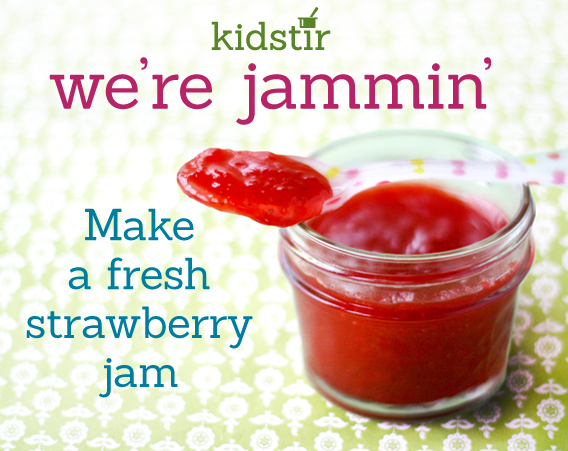 Teach your kids how to turn fresh picked strawberries into real jam! It’s surprisingly easy to make from scratch. This recipe skips the complicated canning steps—and the jam can be stored in the fridge for up to 2 weeks or stored in the freezer for up to a year (just thaw before eating!). You’ll need to pick up pectin, the all-natural fruit preservative that helps thicken and preserve the jam. 1. First, hull the strawberries (cut off the stems). Place them into a blender or food processor. 2. A grown-up can help blend the strawberries until they are crushed. You’ll need about 1 ½ cups crushed strawberries. 3. Pour the strawberries into a cooking pot. Stir in the pectin powder and sugar. 4. A grown-up should heat the strawberry mixture over medium-high until it bubbles. Boil the jam for 5 minutes, stirring often. Carefully pour the hot jam through a funnel into 4 small jam jars. 5. Let the jam sit at room temperature for a few hours, then screw on the jar tops and store in the fridge overnight to set. It will last in the fridge for 2 weeks—or up to a year in the freezer.